Each module is connected by an integral side connector that supplies internal communications and power. 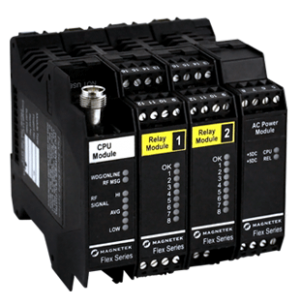 The RDSI module is designed to communicate via a serial interface to directly control Magnetek’s IMPULSE®•G+/VG+ Series 4, Series 3, and IMPULSE®•G+ Mini Adjustable Frequency Crane Controls (consult factory for compatibility if you have an existing RDSI setup with a Series 2 drive). It provides users with diagnostic and troubleshooting information on the ground so there is no need to get up on the crane. Our Pre-engineered systems are packaged with one of our versatile transmitters, and offer features not found in most off-the-shelf systems. We’ll build a system to your exact specifications. 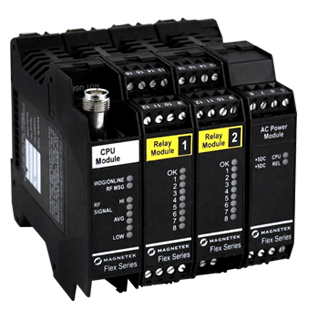 Transfer switch options include Effective, Directional, and Complete isolation with 4, 10, 14, or 20 pole switches. Relay isolation also available.